Pearl Restaurant is one of the Top Five Highest-rated Restaurant in Tripadvisor in the island of Panglao. Their ambiance, food preparation, and amazing sunset view is breathtaking. 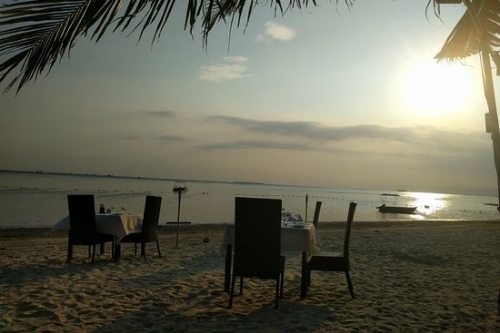 This restaurant is located at Daorong Blvd., Panglao its a five 5 minutes drive from the famous Alona Beach, 10 minutes drive from San Agustin Church and Panglao Centre. Cuisine offer from Filipino, Seafood, European, Asian and International. They cater from Breakfast, Lunch, Diner, with Free wifi, Full Bar, Outdoor seating, Parking Available and Reservations. Excellent service, excellent food, excellent drinks, very good prices. Unlike most restaurants I've been to in the Philippines-- everything on the menu was available. The service was on point. We had lunch, the menu is huge with options for everyone, even a picky vegetarian like me! I would highly recommend!! Wonderful restaurant they have an extensive menu and the food is a delight I would say this is my favourite restaurant service is excellent and the location on a beautiful beach. I cant wait to return here its my number 1 choice of places to eat. Lots of vegan options and a great setting! My friend and I stumbled on this restaurant after a sunset cocktail at the bar next door. And we are so glad we did! The food here is incredible, the service top notch and the setting beautiful. Our server, Ricky, was a delight and attended to us very well. We noted down my dietary requirements- vegan- and happily made alterations to my meal choices to suit me. The veggie pizza (made without cheese for me) was delicious and the potato nuggets- yum! We washed it all down with a very reasonably priced bottle of prosecco. The hotel called us a tricycle to return us back to our hotel and it was waiting outside for us when we were ready. I hope to return here soon! Thank you for a magical evening.